Compared to the traditional sheep breeds in Chile, the Goldensheep is characterized by superior fertility, leaner meat, and significant daily weight gain of lambs. Recent years have not been easy forsheep farming in Chile, which has been evident in the decline of the flocks in much of the country (except in Magallanes) and the reduction of meat exports. It is essential to find formulas that allow producers to improve performance. Some have opted in recent years to seek new genetic alternatives in order to increase production and profitability. A clear example of this effort is the Goldensheep breed, that slowly has begun to be considered as a legitimate alternative for sheep farming in the south of Chile. The Goldensheep is a composite-breed of Chilean origin, created in 2000. The breed´s reproductivity and meat quality have been proven to exceed all others. This, in effect, means tremendous economic contribution to the chilean sheep farmers . Despite the outstanding productive and meat quality characteristics of this breed, their proliferation has been slow. And the local market is still very small, because the sheep meat has just started to have a constant presence in supermarkets and finer restaurants. The limited availability of purebred sheep – there´s only one farm with 2.000 purebred ewes in Osorno. Also,there are very few sheep farmers in the south of Chile, where cattle and dairying are the main activities. On the other hand, many farmers are not going to change breeds until they see more of their neighboring farmers doing the same. Cattle farmers in Chile are particularly traditional, and skeptical about adopting new technologies, or doing anything contrary to their fathers, until they have seen it in practice for a long period of time. Goldensheep lambs reach a carcass weight of 25-27 kg at six month of age and provide a lean meat, characterized by a mild flavor, without odor, and very juicy, thanks to a high percentage of unsaturated fatty acids and omegas. It also has high fat infiltration in muscle areas and external fat only in the pelvic cavity. No other commercial sheep breed in Chile is able to produce lambs with more than 17 kg of meat, due to their excessive fattiness and abundant saturated fatty acids, producing strong tallow odor. This has been the main reason for rejection of lambs in the local market. The Goldensheep females weigh 70 kg, while the rams can reach 90 kg. In the case of lambs, daily weight gain during first 100 days of lactation averages 0.4 kg/ day for singles. Twins and triplets gain 0.3 kg / day and 0.25kg / day, respectively. Regarding the final weight, single lambs reach 55 kg live weight in 120 days. Twins, meanwhile, will reach 55 kg live weight at 150 days. In the case of triplets, 50 kg live weight in 165 days. Note: these results require not only the breed but also excellent pastures and management. While the Goldensheep is a meat breed is also capable of producing up to 4 kg of wool, fineness of 28-30 microns and 72% yield. Lactation in this breed is characterised by abundance, with a peak exceeding 4 liters daily and a persistency for up to five months, compared with only 100 days in traditional Chilean sheep breeds. Rates of daily gain of lambs are more than double those of traditional breeds, reflecting the higher milk production. The Goldensheep females stand out for their sexual precocity and fertility. They are easily able to reproduce at seven months of age, and to have their first lambing at one year of age. In Chile, there is no other breed that has this characteristic. It has a good longevity living up to 8 years, and typically has at least 8 lambings. Most other breeds of sheep used in Chile have a productive life of 7 years, and average only 5 lambings. The potential prolificacy can reach 185% for adult females (almost two lambs born per adult sheep) under a regimen of good nutrition during mating. This is significantly more than the traditionally used breeds in Chile can aspire to. While over 80% of the lambs are twins or triplets, the breed still presents a greater than 300 grams daily live weight gain, which is almost double that of single lambs from other breeds. Mortality between birth and weaning is around 15% if managed efficiently. You can expect one lamb weaned per ewe hogget at the age of one year, and 1.6 lambs weaned per adult sheep between two and eight years of age, with a useful life of eight lambings. With these parameters in a flock of sheep of all ages, 145 lambs are produced per 100 ewes mated, includng the ewe hoggets There´s no comparable success from any other breed in Chilean sheep farming. 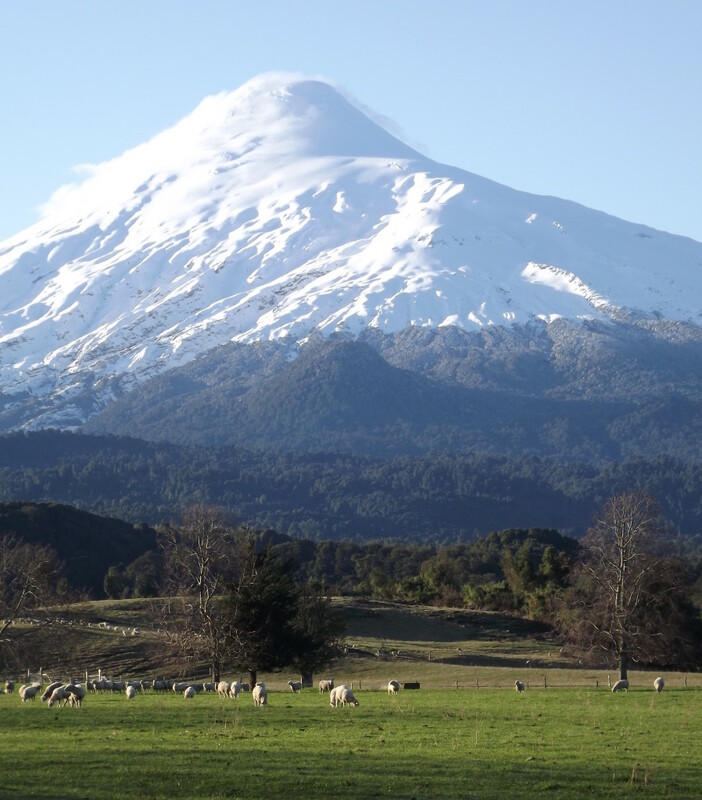 While it can be successful anywhere in the central to southern regions of Chile, the Goldensheep breed will reach its maximum production potential in places with high quality sown pastures ie, in regions such as La Araucanía, Los Lagos and Los Rios. In fact, this breed has also been tested in the arid central area, from which it originated. Their productive results exceed those of the local Suffolk and Merino breeds, but are much lower than the results achieved by the Goldensheep in the south, due to the poor productiviy of the central prairies. The biggest problem in the central area is the tendency to droughts,with at least 8 month with no rain at all and it´s predicted that the future will be more arid. In the south of Chile, with optimal quality pastures producing 15 tons of dry matter per year, you can sustain between 15 and 20 sheep/ hectare, where the Goldensheep flocks with their ultra heavy lambs produce about 1,300 kg of live weight/ hectare. The highest productive prairies have soil levels above 15 ppm phosphorus, pH 5.8 and higher. Agradecimiento a www.chileproperty.com por la traduccion.